Supercharge Batteries have been manufacturing boat, truck and car batteries since 1984, all products are made using market-leading Expanded Grid (EXG) technology, which helps Supercharge batteries to be one of the most reliable battery distributor in Australia. 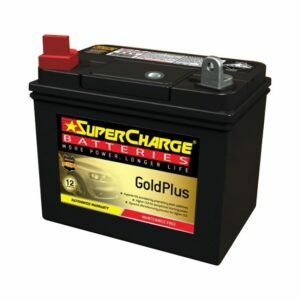 The Supercharge Gold Plus product is a high performance range, which is the most long lasting, and most durable on the market, whether it be for automotive, truck or marine battery. If you are looking for a high performance battery with an excellent nationwide warranty back upperiod, you can’t go wrong. 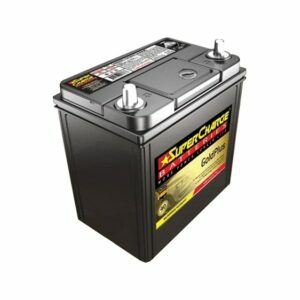 Battery Central Brisbane is your local stockist of the Supercharge Gold plus range of Supercharge automotive batteries for passenger vehicles, commercial vehicles. Battery Central Brisbane’s onroad support can supply and fit Supercharge Gold Plus batteries roadside or at your home or business. If you own a European vehicle fitted with the Stop Start option, Battery Central can reset your computer with the Yu Fit Battery at the same time. We offer free in store fitting and free delivery in and around Brisbane, Logan and Ipswich (if fitting isn’t required).